Last night’s football game between the Oklahoma State Cowboys and the Texas A & M Aggies was bizarre. It was mayhem. The players and the fans alike, on both sides, went through an emotional roller coaster and the ride ended somewhere in the Tricky Hall of Mirrors…people were still reaching out to test reality as they led themselves out of the stadium. Confused, elated, exhausted…or in the Aggies’ case, beaten. And in the Cowboys’ case – at least this time – celebrating. As I was riding home last night I started thinking about the superheros who contributed to the OSU win. I think the tuba section in the band gets at least one vote; they took the Three Dog Night hit, Never Been to Spain (You know… “I’ve never been to heaven, but I’ve been to Oklahoma; Oh they tell me I was born there…), two extra verses during a national TV timeout and had most everyone in the audience singing along by the time they finished. The players get three votes. One lost the rest of the season to a knee injury. One played on no sleep because his baby girl was in the hospital the night before. The defense probably gets four votes because they played against 106 snaps…the game was an extra-long grueling mess for those boys. But this morning, when I think back to what helped me get through the game, five personal votes go to the kid in the orange cape. I’ve seen him there before. He’s the kid who sends his eyeglasses into all sorts of contortions by sticking both fingers in his ears when Pistol Pete shoots his shotgun before the game. Obviously he doesn’t like loud noises. But last night I think he saved my husband from at least two cases of hyperventilation and possibly one cardiac arrest by just doing what he did all night long. The kid pretend-flew. He twirled around and around. And around some more. Sometimes he leaned over the handrails and actually watched the game. 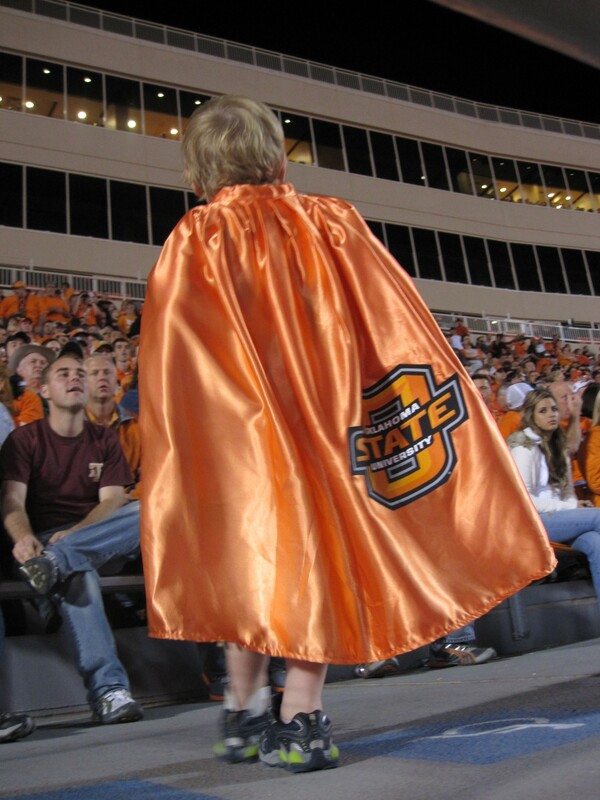 And, he ran up and down the stairs so that his cape would go flying behind him like a big orange banner. The kid was Super Cool. Nothing phased him. And he completely distracted the convulsing adult fan base at just the right times. Last night he was my hero, and this morning I’m giving him my Friday morning post. Here’s to you, Super Cool. May the wind beneath your cape take you around your pretend world over and over again. Previous PostMe Do It Myself: The Toddler SyndromeNext PostCardiac or Clutch? Who are these Cowboys? Judging from your pictures you must have seen the lady in the handicapped section that took her leg off and was waiving it in the air! If you missed it I can send you a picture. Kelly, I like you was watching the video and had to ask what all the hoopla was about! And somehow I missed the caped wonder. I guess I was too busy watching the game and the kids around me. Jani – laying in bed last night, gazing at my iPad, I laughed out loud so hard…we’re talking BELLY LAUGH when I read your comment. I’m e-mailing you right now. I would LOVE a picture of that one-legged wonder, screaming her team on to victory…just awesome. Yeah…the kids are strategically placed every section so each one has its own little personality, I think. What? No vote for the guy who inappropriately groped his partner on the kiss cam? That was the best crowd reaction I’ve heard/seen in a LONG time – maybe ever! Julie – true. And, I was staring right at the camera and didn’t even see it. The crowd erupted and I looked at Mick and said, “What happened?” He had to ‘splain to me… So, Okay – 1 vote for him too. I can’t put him at two, because I don’t think he deserves more than a tuba player!